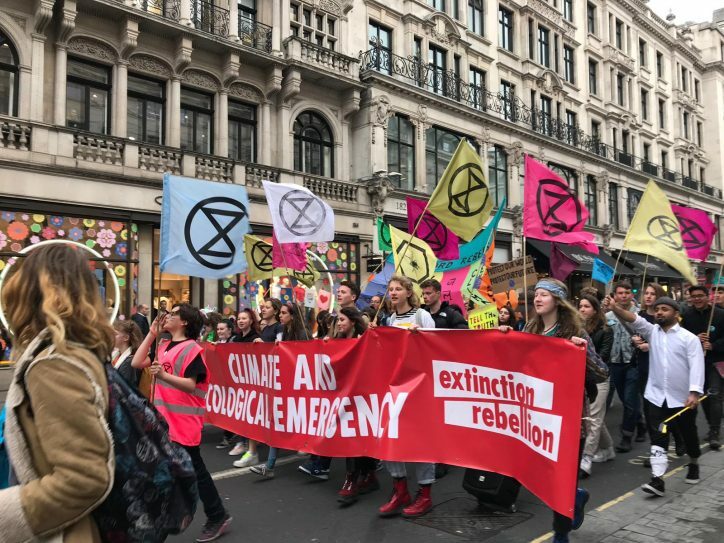 Activists from the Extinction Rebellion movement are set to “disrupt business as usual” in Dublin this Friday to protest against inaction from policymakers on climate change and biodiversity decline. The Irish branch of the group will hold a demonstration at lunchtime this Friday in front of the Spire at 1 pm as part of the Week of International Rebellion taking place in 43 countries around the world. The week-long protest aims for governments to take the movement’s core demands on board, which include informing the public about the scale of the ecological crisis. Anticipated disruptive actions include public space occupations and the blockading of bridges, roads, harbours and transit systems. Other demonstrations such as die-ins, funeral processions, banner drops, street art, and theatre performances have also been planned. Over 100 protesters have already been arrested in London. The movement began with 10 people in the UK last summer and rose to prominence in November 2018 when thousands of activists blocked London bridges, disrupted traffic, and glued themselves to public buildings. Extinction Rebellion Ireland said that it has been “forced to take this action” due to the Government’s “criminal inaction” on climate change. Ciarán O’Carroll, a member of the Irish branch, said that activists have “tried marching, and lobbying and signing petitions” but to no avail in terms of any identifiable policy change. The group is calling on the government to declare a “climate and ecological emergency”, to inform the public of the scale of climate change, and to enact legally binding policy changes that would allow Ireland to become carbon neutral by 2030. The report also found that Sweden, Portugal, Denmark, the Netherlands, Finland, and France have high ambition to attain net-zero emissions by 2050 at the latest. “If even a small part of you is sitting at home wondering what to do about the climate and ecological emergency, this is what we need to do,” Extinction Rebellion Ireland said in a statement announcing Friday’s action. “This is the best shot we have, we can’t get a new planet,” the group stressed. Irish Extinction Rebellion activists marked World Wildlife Day in March with a mock Funeral for Humanity in the centre of Dublin to highlight the planet’s extinction crisis. Roughly one-third of Ireland’s 98 wild bee species are threatened with extinction, and recent findings show that over 60 percent of the 202 species of commonly occurring birds in Ireland is now on the red and amber conservation lists. Additionally, over 90 per cent of 58 listed habitats in Ireland have been labelled as having an “inadequate” or “bad” status, while just over half of the 61 European protected species in Ireland have a “favourable” conservation status.